For anyone wanting to learn the art and craft of 3D modelling and animation, there are few better starting points than Cheetah3D. Developed exclusively for Mac OS X, it features a friendly if prosaic user interface, which conceals some powerful tools. The toolset enables you to model, texture, pose, animate and render your models, from characters to environments. It also has decent import capabilities if you use other 3D packages, with 3DS, LWO and OBJ among the industry standard formats it supports. New tools since version 4 include a revamped materials system, which enables you to define surface properties directly. The system's node editor lets you get right under the skin of a material. Rendering is perhaps the area that's received the most attention, though: it's up to ten times faster than in previous releases, thanks to finely tuned hyperthreading and multi-core support. However, there's no marquee render to enable you to preview one section of your scene. 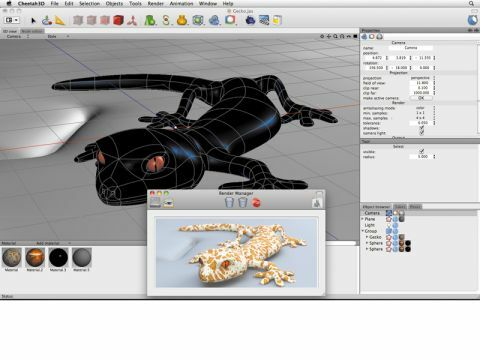 Cheetah3D still lacks features you would get in flagship 3D packages such as Cinema 4D or modo. But the most obvious absences are addressed with each passing update, and Cheetah3D is a fraction of the price. The powerful render system means that professional 3D artists should consider it. The animation system is more limited, but accessible for newcomers. If you find the open-source Blender too confusing, try this instead.